The New York Rangers did everything they were supposed to do. They got a ton of shots on goal, challenging a goaltender in Jeff Zatkoff who wasn't supposed to be able to handle the playoff action. They badly out-possessed a Penguins team that has been far superior to them in driving play. They did a great job of clogging the neutral zone and preventing Pittsburgh from being able to use their team speed. And they still lost by a score of 5-2. Patrick Hornqvist had his first career hat trick and added an assist, Sidney Crosby had a goal and two assists, and Zatkoff stopped 35 of 37 shots as the Penguins were able to shrug off the Rangers' control of the gameplay to win comfortably. Tom Kuhnhackl had the other Pittsburgh goal with a shorthanded tally in the 3rd period. It was an uncharacteristic start for both team to start of the game as the Rangers, not the Penguins, got the upper hand in the possession game. The Pens allowed the Rangers to pin them in their own zone as they tested Jeff Zatkoff early, but for his credit Zatkoff was able to make several big saves to keep the game scoreless. Pittsburgh was having difficulty breaking through the neutral zone in transition, and it was allowing a normally bad possession team in New York to get the majority of the early chances. The Pens would get their first power play five minutes into the game when Viktor Stalberg was called for hooking Jeff Schultz off a faceoff, but they would have difficulty getting set up and the Rangers would kill it off without much difficulty. New York would continue to drive play after Stalberg returned to the ice to bring the teams back to 5-on-5 play, and it felt like the Pens needed something to break them out of their funk. Stalberg would pick up another minor penalty when he was called for a hit to the head of Ian Cole, though to Stalberg's credit it looked like a clean check on replay. It wouldn't matter much, as Pittsburgh was largely ineffective for the second time with the man advantage, and the teams would continue scoreless. The bad calls would go against both sides, as shortly after the New York penalty Eric Fehr was called for unsportsmanlike conduct for spraying Henrik Lundqvist as he covered the puck. The Pens would have their best chance of the game as Carl Hagelin redirected a Kris Letang shot pass just over the cross bar. There was a scary moment with less than a minute remaining in the period when Marc Staal's stick caught Lundqvist in the mask. Lundqvist immediately dropped to the ice with his glove over his face, and after an extended break as he tried shaking it off he was able to stay in the game. 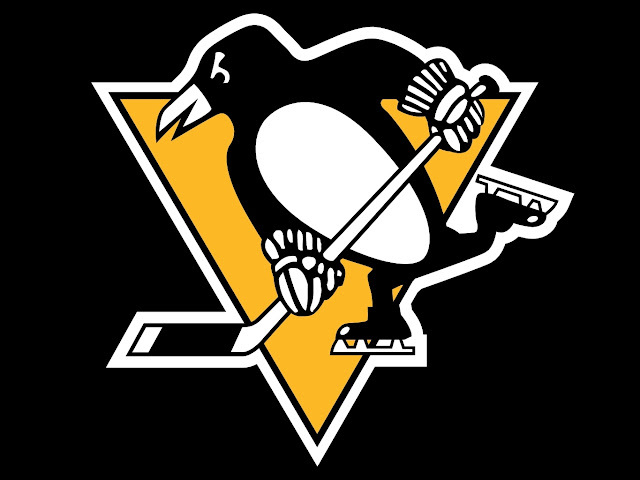 It looked like the Penguins were going to be fortunate taking a tie game into the first intermission, but Patric Hornqvist snuck a shot five hole to give Pittsburgh a 1-0 lead in a period where they got thoroughly outplayed by New York. And it would be Antti Raanta, not Henrik Lundqvist, who would come out in net for the Rangers to start the 2nd period. Things would get worse for New York when Chris Kreider was called for interference on Letang just 9 seconds into the period. Chris Kunitz would ring a shot off the cross bar, but other than that the Pens would continue to have difficulty getting going on the power play, and on the opportunity Tanner Glass would take a puck to the face in the neutral zone and leave the game, but he'd later return. It would continue to be a sloppy game for both teams, but the Penguins would continue to get their feet underneath them and they started driving play back into the New York zone. Dominic Moore would be sent off for holding Tom Kuhnhackl midway through the period, and the Penguins had their best power play of the game with several great scoring chances, but unfortunately Trevor Daley would take a tripping penalty on Rick Nash while trying to break up a shorthanded 2-on-1 rush, and the Rangers would have 1:43 of 5-on-4 action to work with. New York would also enjoy extended zone time with several good looks, but the Pittsburgh penalty kill was able to hold strong and keep it a one goal game. The Penguins were finally able to extend their lead with just over a minute left in the 2nd period when Hornqvist threaded a pass between the Rangers defensemen to spring Sidney Crosby for a breakaway, and Crosby was able to tuck the puck inside the right post to make it 2-0 Pittsburgh on a another goal late in the period. The Rangers would come out for the 3rd period pushing to get the next goal to cut the lead to 1-0, and Derek Stepan nearly had it after he pinged a shot off the post. They'd get as good of an opportunity as they could after Hagelin took a high sticking double minor against Kevin Hayes on the same play where Cole would be called for interference for dumping Eric Staal in front of the Pittsburgh goal. It would give the Rangers a 5-on-3 power play, and they'd cut the lead to 2-1 after Rick Nash fed Stepan cross crease for an easy shot into the empty net. Not only were the Rangers able to get the goal, but the goal gave New York an extended power play to try tying the game. Derick Brassard nearly scored the goal to even things up after Zatkoff gave up a huge rebound straight to him on the far post, but Ben Lovejoy was able to make a huge swipe at the puck to knock it out of harm's way. It would prove to be a huge play, because not only would it preserve the lead but seconds later Nick Bonino would feed Tom Kuhnhackl for a shorthanded goal to make it 3-1 Pittsburgh. It was a huge swing in moment, and it ensured that the Rangers would end their 4 minute power play and 5-on-3 opportunity with the same two goal deficit as when it started. Shortly after Hagelin's penalty expired, the Penguins would get another power play when Eric Staal collided with Zatkoff in his crease, drawing the goaltender interference penalty, and it wouldn't take long for Pittsburgh to make it 4-1 as Hornqvist crashed the net and poked a loose puck into the net. Alain Vigneault would challenge the goal as Phil Kessel was in the crease, but it was pure desperation on his part as Raanta didn't touch Kessel and wasn't forced to go out of his way trying to stop Hornqvist. 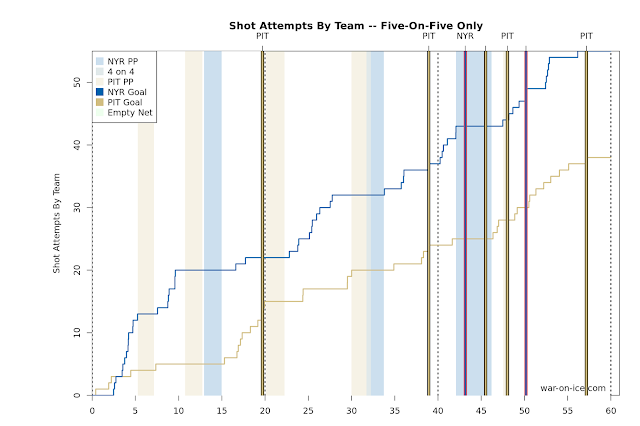 New York would pull back to within two goals midway through the 3rd period. Zatkoff faced a fairly harmless shot from Dan Boyle, but he gave up an awful rebound that Stepan was able to chip in for his second of the game. The Penguins nearly restored the three goal lead moments later when a bad Rangers line change led to Hagelin in all alone on Raanta, but he wasn't able to beat the backup. Vigneault would pull Raanta early for the extra skater, and almost immediately the Penguins were able to make him pay as Crosby found Hornqvist behind the defense for the hat trick goal on the empty net. The Rangers were the worst possession team to make the postseason, but they were able to come out on top against one of the best as Pittsburgh managed only a score-adjusted 42.3 CF%. It's not a results that would seem to be sustainable for New York, and they'll have even more trouble against the Penguins if Lundqvist's injury is going to force him to miss more time. Both Lundqvist and Fleury should be day to day for Saturday's game, and if Pittsburgh can get back to playing the strong possession they displayed down the stretch it could be a short series.